AVEDA set up their Beauty Bar to style the strands of many wise beauties, including Aloha Dreamboard founder and dream coach, Tiare Thomas. Where they got up close and personal, interviewing a selected group of Wanderlust influencers to share tips to help you discover your inner yogi. Click here to check out what Thomas had to share with AVEDA on her personal relationship with yoga. I kid you not....no more than one year ago, I was inspired and decided to commit to adding Wanderlust Festival to our company's dreamboard. Fast forward to this past week, Thursday the 25th of February, and I found myself up on stage, conquering my biggest fear, speaking to an audience of over 150 people, on the stage of the Wanderlust Festival's Speak Easy. Notice the image above. It was randomly taken by Hugh E. Gentry and posted up on the New York Times of my dear friend, Noelani Love and I, as we celebrated manifestation victory at the festival last year. 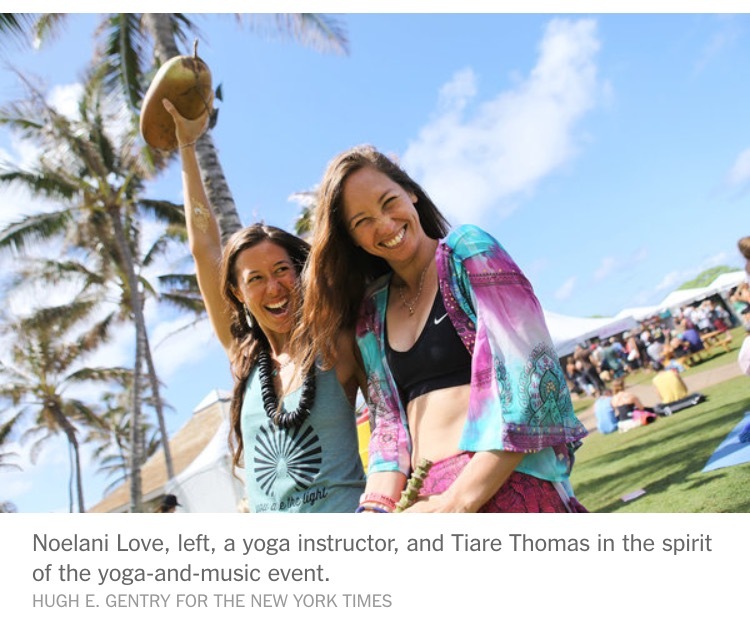 I was there, strictly to support my two soul sisters Noelani Love and Juri Ko Edwards, as they had been selected to teach yoga classes at the 2015 Wanderlust Festival. How did we all get there? What I believe was hard work, determination, and a touch of manifestation, is what lead us to being invited to teach and share at the popular and largest yoga festival in the Nation, at least that I personally know of. Let's start with my two lovely friends. Noelani and Juri, at the time, fairly newly certified yoga instructors, shared with me what a big deal it would be to teach a yoga class at this amazing and grand yoga festival, called "Wanderlust." I had only a tiny idea of what they were talking about at the time, because I've heard people talking about the festival, but I've never actually attended, nor did I ever see any photos. So, not much more than a year before 2015's Wanderlust Festival, both women decided that they would put it out there in the universe, add it to their dreamboards, to one day teach a class there. I can't tell you how excited and happy I was for them, when they individually shared with me the exciting news, that each of them had been asked to lead a number of yoga classes at the festival for 2014. Within a year of them putting it out there, these two women had manifested what some may believe to be a miracle. How cool is that?! Honestly, I would have never attended this festival (only because I didn't know enough about it) if it weren't for my desire to support Noelani (who introduced me to the vision boarding concept and eventually became one of my long term dream clients) and Juri (a dreamboard client since my early years of leading workshops). More so than clients, these two women have been a collective of my dearest friends and supporters. And there was no way I'd miss this for the world. But after attending their classes and experiencing other amazing classes, all at the festival, I fell in love with what the Wanderlust Festival was all about. Not only was I proud of Noelani and Juri, but I was also inspired by the two beauties and the other incredibly talented yogis I took classes from due to their individual styles of connecting with hundreds of people per class on a very deep and spiritual level. It melted my heart to see so many people sharing a healthy practice together as a unit. During that time at the festival, I also wound up taking a meditation class where I met a very friendly man who introduced himself as a leader of vision boards. His name was Nick Mirabello, Chief Igniter of UROCK. I was so excited to finally meet someone who actually teaches dreamboarding, because I've always wished to connect with others who shared this practice as well, in hopes of gaining insight and master minding on how we could better serve our curious dreamers and community. Nick was so excited to share that he just finished meeting with some of the coordinators from the festival and he would eventually be leading vision board workshops at future Wanderlust Festivals. It was so interesting, because earlier that day, the question and thought of, "I wonder if this festival would ever have me lead a workshop here?" popped in my mind. And after he shared with me the news, I was hopeful that "Wow! Maybe I could do the same one day?" Months passed by and I had shared with another dear friend and soul sister, Angela Aguirre, about Noelani and Juri's success at the festival as well as how much fun and cool this festival was for me. I told her that I loved it so much, I'd like to go every year and check out others across the country. So, when Angela and I did our next dreamboard session together, she was inspired and added it to her own dreamboard so that she would one day be able to enjoy the festival on Oahu. Within months, Angela and I found ourselves at the Wanderlust 108 in California on the Santa Monica Pier. She was pregnant at the time and enjoying every bit of it. We participated in the mini triathlon, where we ran the beach, did yoga under the guidance of MC Yogi, joined in on a huge group guided meditation, and danced the day away to DJ Drez. I remember having the time of our lives. After the festival, I gave it a long shot and asked one of the presenters if they had a contact to any of the lead staff so I could possibly reach out in hopes of leading a dreamboard workshop at any of the future Wanderlust Festivals. I was given an email address and name, yet never went about reaching out. My self doubt, for some reason, took over and I figured, "Maybe it's just not the right time? I mean, what would I say? And would I get rejected?" Every person who has ever taken one of my dreamboard workshops or had a one-on-one session with me knows that I passionately express the power of positive thinking and belief. There is a block that comes up as soon as we decide we don't believe...believe in the possibilities and believe in ourselves. Well, I am only human, and I battle with belief on the regular. Although, I do acknowledge it in time and attack it head on, just because I know that once I kick down that wall of self-doubt and negative self talk, my manifesting powers, in time, celebrate in victory. Although procrastination on reaching out to the Wanderlust staff won, in time, I still decided to add "Wanderlust" to my company dreamboard. It was a few months after Wanderlust 108 in California, during the summer of 2015, when Angela and I were sitting at her dining room table coaching each other as well as fantasizing about how cool it would be for both of us to eventually be presenters at this inspiring festival. Angela is also a Life Coach. She's actually the one who inspired me to getting my life coaching certification in the first place. We have been supporting each others dreams since the day we met. As soon as I flew back to Hawai‘i, I immediately and officially added "Wanderlust" to my dreamboard. I didn't know how or when this would ever happen, but I knew that as long as I trust in the process, it would eventually come to fruition. But, if you were to ask me if I ever imagined speaking on stage at Wanderlust within less than a year, you would definitely feel a shocking reaction. And I would shake my head in disbelief thinking, "that's a bit soon. Don't you think?" Well, to my disbelief, during the end of 2014, a friend of mine shared with me that he spoke to his friend and said that I'd make a good fit for this event happening during the beginning of 2015 at the Hilton's Turtle Bay Resort on the North Shore of Oahu, called "Wanderlust." One email lead to the next and in a matter of a week, I was in direct contact with the coordinator of the festival who booked me immediately. OMG!!!? I felt shocked, excited, happy, nervous, and totally blissed out! It was all happening! My dream was coming true. And I would be able to share this life changing practice with hundreds, most people know as "dreamboarding" or "vision boarding." This not only meant I'd be living my dream, but it would hopefully inspire others to pursue their dreams and live them as well. Now, fast forward to this past Thursday. I was back stage at the festival, waiting to step out and begin my talk, when Erik, my boyfriend, gently grabs me close to him to dance to the song I chose to play for the audience to get us all into the mood of dreaming. I melted in his arms as he calmed me from my nervous tendencies when it comes to public speaking. As I stepped out on stage. Angela was there, sitting at a table in the front row smiling with more of my dear friends. Not only had she flown in from LA to support me, but she was also living her dream, as she was able to finally participate in attending the festivities of the Wanderlust Festival. I felt so much love and couldn't help but smile and express to everyone how cool this moment was for me and how excited I was to share with them about a tool and practice that has changed my life, and for the better. After fifty five minutes of wholeheartedly sharing significant moments through out my life journey and the key to manifesting, I ended with five minutes of a guided and then musical visualization. I asked everyone to think about a dream that they've been putting on hold or haven't committed to yet and then to imagine themselves actually living that dream. The song I chose to co-create with the audiences imagination is called "Rise Up" by Andra Day. If you ever have a chance to download it and add it to your play list, this song is very moving and I hope it melts your heart as much as it does for me. And for that we have each other," is everything Aloha Dreamboard and I personally stand for. I believe by discovering and pursuing our own dreams, we give others hope to eventually pursue and live their own dreams. And in return, we have that many more happy individuals sharing a message that is inspiring and powerful. This is exactly what happened for me when I observed Noelani, Juri, and Nick (the vision board guy) excited, believing, having the courage to pursue their dreams and then in return manifested their dreams into reality. While Angela inspired me through her enthusiasm and supportive encouragement on believing that it could one day happen for me. And as they graciously shared their stories of success with me, it ignited a passion I was fearing to spark up (due to possible rejection). And in return, the fear was put out and my dream had won! My hope is that you too, have the courage to pursue and share your dreams so that one day it will inspire others, observing along the way, to rise up and have the courage to set and pursue their own.